This is Jake! I got him as an early Christmas present, and he is such a love! He is 8 weeks old, and already learned how to sit and come on the first day home! It's now two days later, and he is working very hard on the down command! Just like any other puppy, he LOVES to sleep. 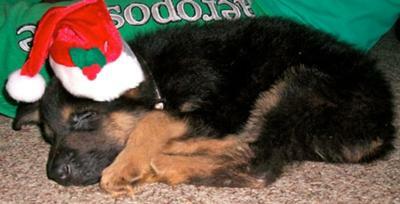 While he was sleeping on the day that we got him, I shot this photo of him wearing an adorable Christmas hat! He truly is, in my eyes, the best little puppy in the world. I hope you think he is as cute as I do!